In the 17th century, on the spot of the present Odeon Theatre, there was the estate of the sword bearer Dumitrache Ghica. It was a part of the dowry his wife, Maria Vacarescu, had brought him. In 1768, on the same spot, there was the house of a boyar. In 1813, Ioan Caragea rented the estate to establish here his Court. Next year, he also rented the Slatineanu House (built on the spot of the present Capsa restaurant, 38, Victoria Street,). The Court remained here until 1825. Caragea’s Court was made up of the main building and the stables( on their spot, there is nowadays the Majestic Hotel). In 1860, the Ghica Houses were bought by Nicolae Lahovary, who owned them until the nationalization in 1948. From 1860 to 1945, the modernization of Victoria Street included the Lahovary estate, as well. Different institutions or stores, like The Youth Club, The Mercury Society, The National Party, a brewery, etc, rented the old Ghica House. On the north side of the estate, a building was built. It became the headquarters of the famous newspaper L’Independance Roumanie (Here was held the first projection of the Lumiere films). At the beginning of the 20th century, the architect Grigore Cerchez designed an impressive architectural complex: The Comedy Theatre, on the Academy Street, that had its façade on Victoria Street, two lateral wings, a building of stores and apartments, and the Majestic Hotel. 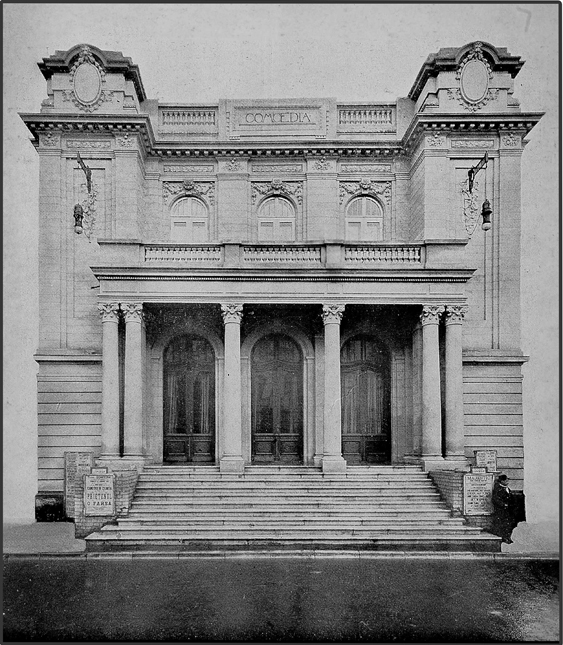 The Theatre was inaugurated on December, the 25th, 1911. 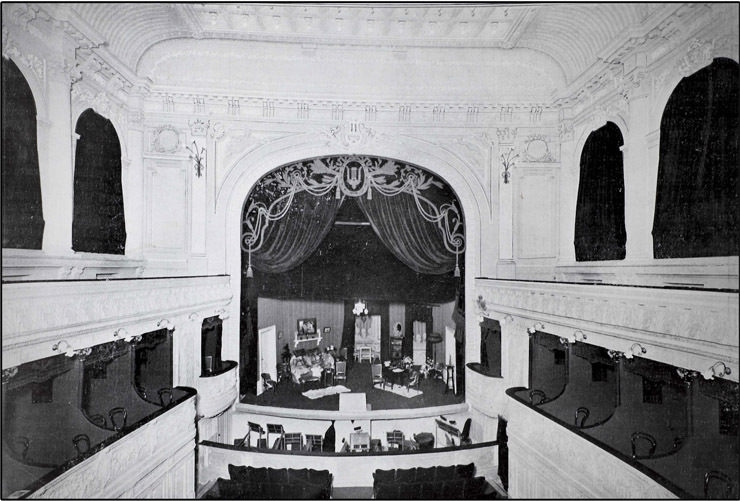 In the ‘30s, the Theatre Hall was enlarged, the stage was raised and another rooms were added. The 1945 bombardments distroyed the building, which was reconditioned afterwards. Until the ‘60s, the old house was transformed into a bookstore, and the Majestic Hotel was closed, to be re-opened, in the ‘70s. In 1974, The Comedy Hall of the National Theatre becomes the Majestic Hall of the Giuleşti Theatre and the theatre Giuleşti becomes, starting 1990, Odeon Theatre. In the 80s on Victoria Street, a new building was built on the area now empty after demolitions. The alveole in the front of the theatre was now constructed. In 2002 the building of the Odeon Theatre is almost completely renovated. 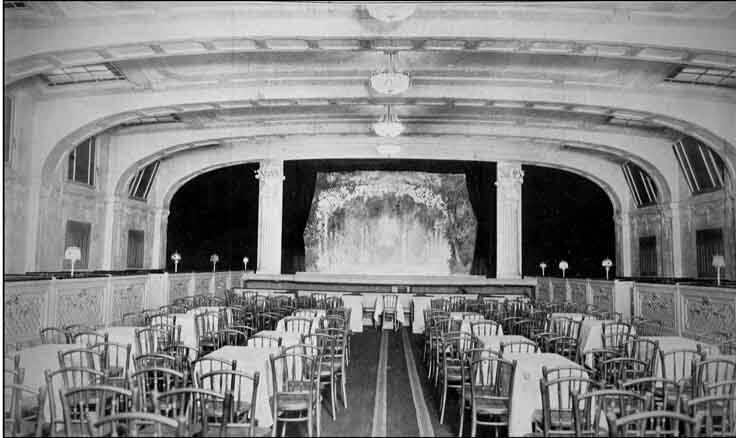 The floor of the stage was replaced, the chairs were changed, the walls were cleaned and painted. The ceiling sliding system was repaired. The interior and exterior stairs were also rebuilt, using Vratsa (Bulgaria) stone. The ODEON Theatre, one of Bucharest's leading theatre companies, was founded in 1946 as Giulesti Theatre. It is situated in the very heart of the city since 1974, in a historical monument building, which we celebrated its centenary in 2011. Moreover, the Majestic Hall of the theatre is the most elegant auditorium from Bucharest and one of the very few one in Europe with a sliding ceiling. In 1990, The Giulesti Theatre changed its name into Odeon Theatre. The Odeon Theatre is a repertory theatre subsidized by the Bucharest City Hall. It has a permanent company of 35 actors, two stage directors, one stage designer. 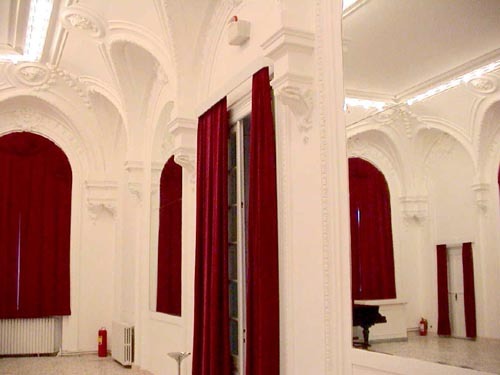 It has a stage a l‘italienne with the capacity of the auditorium of 300 seats and a studio hall. Over time, its productions took part in various international festivals and had many tours: in Rome (Italy) with Master Manole by Lucian Blaga and Measure for measure by W. Shakespeare (in 1973), in URSS (in the same year) with the same two titles and also The house that ran away though the door by Petru Vintilă all directed by Dinu Cernescu. In Arezzo (Italy) with the production Năpasta by I.L. Caragiale, directed by Alexa Visarion (1979). In Great Britain, with the director Mihai Maniutiu’s version of Richard III (1994) or the one to Bratislava, Slovakia with The Barber of Seville, directed by Dinu Cernescu (1996). At the Gipsy Women, directed by Alexander Hausvater was invited at Oldenburg, Germany (1996). Saragosa- 66 days, directed by Alexandru Dabija, was invited to the Theatre der Welt Festival, in Berlin, 1999 and at the World Exhibition, in Hanover, 2000. Bios and Eros, directed by Dragos Galgotiu, took part in the Experimental Theatre Festival, in Cairo, Egypt; The Gossip Ladies toured Canada and Alexandru Dabija’s The Boss Gradys Boys was invited in Berlin, 2001. In 2003, Why does the child boil in the polenta directed by Radu Afrim participated at Journées théatrales de Carthage, in Tunis and in 2004 at New Plays from Europe Theatre Biennale in Wiesbaden, Germany. In 2006, Thursdayparty directed by Radu Afrim was presented in Hungary, in Budapest and Debrecen, while The Picture of Dorian Gray directed by Dragos Galgotiu was showcased in Brussel, Belgium. In 2007, Un tango mas was invited in Jerusalem (Israel), at Budapest (Hungary), at Bassano del Grappa (Italy), for the OperaEstate Festival Veneto Festival, and in 2008 at Madrid during The Romanian Theatre Week. Also in 2007, Ionesco Five Sketches directed by Alexandru Dabija was presented in Paris at La Huchette Theatre. Block Bach was showed in 2007 in Prague, in Paris; in 2008 in Bruxelles and Athens, in 2010 in Poznan (Poland) within the Romanian Culture Week and in 2011 in Berlin. In 2008, The Presidents directed by Sorin Militaru was presented in Madrid during The Romanian Theatre Week, Hamletmachine directed by Dragos Galgotiu was invited at the International Shakespeare Festival, Gdansk (Poland), Just la fin du monde directed by Radu Afrim was invited in Rennes, France during the International Theatre Festival Mettre en scene, and Confession at Tanacu directed by Andrei Şerban was presented in Paris, at The Romanian Embassy headquater. In 2009, the same play was invited in Lodz (Poland), at the International Festival of Pleasant and Unpleasant Plays. In 2012 the production Tlicked was presented at the Festival Meeting of the European Theatre „Close strangers” in Poznan (Poland). From 2012 to 2016 Odeon Theatre was annually invited to the European Theatre Workshop in Ruse (Bulgaria) with the productions Pyramus&Thisbe 4 You, The Resistible Rise of Arturo Ui, Still life with fatty nephew, The Presidents, Time Stands Still. In 2014 the plays Pyramus&Thisbe 4 You and The Resistible Rise of Arturo Ui were presented in Sofia (Bulgaria), and The presidents at the International Theatre Festival in Plodviv (Bulgaria). Between 2013 and 2016 the production Typographic Capital Letters was invited to international theatre festivals in Nitra, Bratislava (Slovakia), Athens (Greece), Dresda (Germany), Prague (Czech Republic), Lublin, Krakow (Poland), Budapest (Hungary), Florence (Italy). In 2016 the play De vanzare/ For sale was part of, along with Against democracy, the selection of the Festival „Una Mirada al mundo” in Madrid, Spain and in 2017 was presented at TAC Festival in Valladolid (Spain). 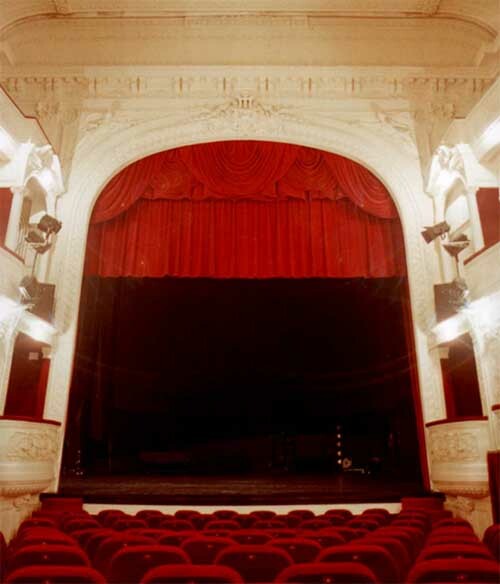 Odeon's performances won a lot of awards: the Award for Best Performance, at the Arezzo Festival, Italy, 1979, The Award for Excellence in 1991 and 1992, The Theatre of the Year in 1993, The Best Performance Award at the National Theatre Festival, 1994, The Best Performance Award at the Romanian Comedy Festival, 1995; in 2015 UNITER prize for the best production.. In the last years, Odeon Theatre’s artists won a series of prizes at the Romanian Theatre Festivals in Piatra Neamt, Galati, Timisoara, Brasov and UNITER Prizes. 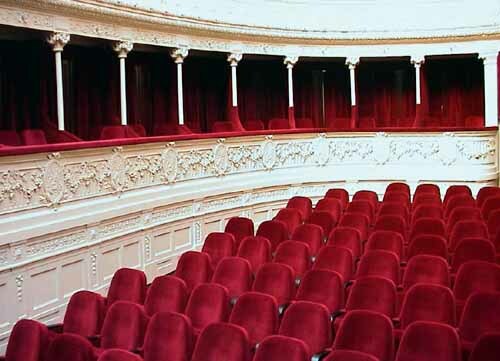 As one of the purposes of Odeon is to educate young spectators, every week there are organized tours behind the stage followed by workshops for children and teenagers, within the programme THEATRE AND SCHOOL. Starting with 2001 the theatre presents the program of READING PERFORMANCES based on contemporary drama followed by debates with the audience. In October 2001, was initiated by the choreographer Razvan Mazilu the programme DANCE AT ODEON, meant to present professional foreign and Romanian dance, in some Extraordinary Galas, that took place monthly. Following the big number of spectators and the enthusiastic reviews, this programme is still running with new openings. The most recent shows are Un Tango mas, a performance on Argentinean tangos by Razvan Mazilu, Block Bach, Shadows of Light, Depeche Dance, Şaraiman. Also in 2001-2002 season was launched the program YOUNG DIRECTORS, CONTEMPORARY TEXTS for students or graduates of art academies. The competition was won by projects which have been included in the current repertoire: The Alchemist based on Paulo Coelho's novel, directed by Anca Maria Colţeanu, norway.today by Igor Bauersima, directed by Andreea Vălean, Genocide or My Liver is Pointless by Werner Schwab, directed by Sorin Militaru, Marisol by Jose Rivera, directed by Alexandru Berceanu, Dead and Alive by Stefan Caraman, directed by Ana Margineanu. In 2003, the project continued with the show Why is the Child boiled in the Polenta based on Aglaja Veteranyi, directed by Radu Afrim, and in 2004 with Fireface by Marius von Mayenburg, directed by Felix Alexa. In 2009 the contest was revived and the winners were Mariana Camarasan and Alexandra Penciuc with The Hell is the Memory Without the Power to Change It by Jonas Gardell and Alexandru Mihail with the play Tlicked by Pintilei Gabriel. The third edition of the festival took place in 2015 and the winners were Horia Suru with The Nether by Jennifer Haley and Vladimir Anton with Donald Margulies’ play Time Stands Still. In May 2006, Odeon Theatre initiated the programme ARTE (American Romanian Theatre Exchange) in partnership with Lark Play Development Center in New York. ARTE consists in a theatre exchange between the playwrights from Romania and The United States, offering them the possibility of upgrading the quality of the plays and translations through the participation at joint work sessions, workshops, meetings and residences taking place at Odeon Theatre and Lark Theatre, New York. During this program, several reading performances were organized in the presence of the authors and realized two productions I Am My Own Wife by Doug Wright and Because He Can by Arthur Kopit. In 2006, was launched a new international programme, ODEON.ART, dedicated to the culture of one country from the European space, which was initiated the same year with Hungarian Theatre Week and continued with the Czech Theatre Week, in 2007, The Dutch Culture Week, in 2008, The Polish Theatre Days, in 2009 The Israeli Culture Week, in 2012 Japanese Culture Days, in 2013 Bulgarian Culture Days and in 2017 Belarusian Culture Days. On September 23, 2010, the Studio Hall was reopened, after 62 years, with the premiere of Tlicked by Gabriel Pintilei. Odeon Studio is a flexible, multipurpose space, the floor consists of modular platform allowing the organization and location of public and acting area in various ways with a capacity of 100 seats. 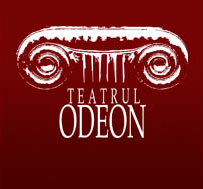 Starting the year 2012 Odeon Theatre is a partner in the European Project FABULAMUNDI. PLAYWRITING EUROPE, first in the pilot edition and in 2013-2014 in the first financed edition through the program Culture 2007-2013 of the European Union. In 2015-2016 the theatre took part in the second edition financed by the EU. During the project, Odeon Theatre did eight translations and reading performances in the authors’ presence and the production Kepler 438b by Guillem Clua. In 2017 the project won again, for a third time, an edition that will take place till 2020, a big scale project along with partners from another 10 European countries and co-financed by the Program Creative Europe of the European Union. In November 2016 we celebrated 70 years from the founding of the theatre and on this occasion we published an anniversary album Odeon 70. An historic-reverential adventure by Miruna Runcan. In 2017 the exterior of the theatre was renovated and the decorative elements on the facade were rebuilt, following the original model from 1911.